Hello friends. Long time no post. Sorry! My husband Darrell and I made the decision one-week before school started to begin homeschooling our 8-year old daughter Aubrey (3rd grade) and our just turned 11-years old today son Justin (5th grade). I never thought that I would homeschool, yet God has a way of introducing circumstances and changing hearts. He changed my heart... He gave me a willingness and even an excitement to begin homeschooling. We weren't exactly prepared for it though. We joined a local Classical Conversations community and love it. I received the majority of my materials the day before our first community class day began and the rest trickled in over the next couple of weeks. Oh, my.... talk about crazy. We just completed our first-semester two-weeks ago and I feel like I'm finally starting to catch on. Now, what does that have to do with the review of Indescribable? Each lesson begins with a scripture verse. Giglio seems to primarily use the International Children's Bible (ICB). There are also lessons from the New International Version (NIV). I'm not happy with the use of the ICB. I truly don't believe that a child needs a simplified version. It is our responsibility as parents to teach our children about God. it can lead to wonderful places when you discuss the meaning of words and concepts that you encounter in the Bible that a child doesn't understand. A conversation about what Bible version is appropriate is hugely controversial, of this I am aware. This is a review, so I'm sharing my thoughts. My children and I have chosen to look up the scripture in our personal bibles, which happen to be the English Standard Version (ESV). The kids rotate who looks up the scripture of the day. This practice helps them to locate passages in their Bible and gives them an opportunity to read God's word out loud. The lesson ends with a very short one or two-sentence prayer relating to the material. Last but not least... my kid's favorite part, Be Amazed. Here you will find fascinating science facts, calls to action, etc. Fun information. 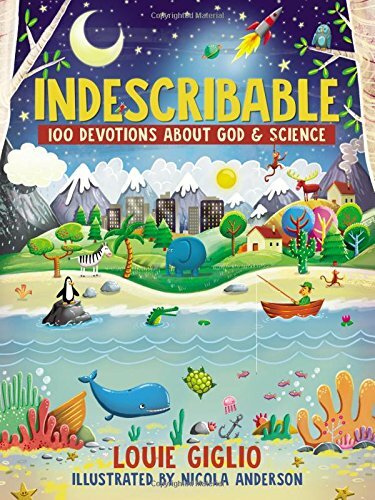 I have found Indescribable: 100 Devotions about God & Science to be a jumping off point for some intimate conversations about God and a whole lot of trips to the Internet to google about the scientific facts involved. I recommend that you get a copy to enjoy with your kids. You definitely don't need to be a homeschool family to learn and have fun with this devotional. Disclosure... I am not an advocate of all things Louie Giglio. He has some theological beliefs that I do not find expressed in scripture. See for yourself. Download a FREE chapter of the book here. Louie Giglio is pastor of Passion City Church and founder of the Passion movement, which exists to call a generation to leverage their lives for the fame of Jesus. Since 1997, Passion has gathered collegiate-aged young people at events across the U.S. and around the world, uniting millions of students in worship, prayer, and justice. In addition to the collegiate gatherings of Passion Conferences, Louie and his wife, Shelley, lead the teams at Passion City Church, sixstepsrecords, and the Passion Global Institute. Louie is the author of The Comeback, The Air I Breathe, I Am Not But I Know I Am, Goliath Must Fall, and Indescribable, his first children's book. Louie and Shelley make their home in Atlanta, Georgia. I am Nicola Anderson AKA AndoTwin. I live in Manchester UK where I work from my home studio crafting imaginary worlds with my Wacom wand whilst my two dogs fight for my lap. I have been illustrating since I could hold a crayon in my hand, but professionally since 2001 when I graduated with a degree in Graphic Design. I work in a mix of mediums (mostly digital) depending upon clients’ needs. Prior to setting upon my own, I spent over 10 years working in-house at a digital agency which has enabled me to become a versatile designer/illustrator. Creativity runs in the genes – the evil twin, ahem, my lovely sister is also a creative entity. This review was originally posted on December 18, 2017 on a poorly thought out secondary book review blog on this site. I'm moving it here to keep this clean and simple.